Summary: No matter what else was going on in his life or where he was—traveling to make movies, at the White House, or sometimes just across the room—Ronald Reagan wrote letters to Nancy Reagan, to express his love, thoughts, and feelings, and to stay in touch. Through these extraordinary letters and reflections, the private character and life of an American president and his first lady are revealed. Nancy Reagan reflects with love and insight on the letters, on her husband, and on the many phases of their life together. A love story spanning half a century and the private life of this classic American couple come vividly alive in this rare and inspiring book. Why You Should Read It: Some days I need to be reminded how much a sweet smile and soft words can melt the ice between two people (especially when you leave out sarcasm and a snarky expression). 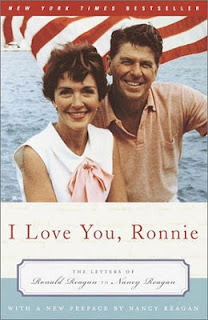 No matter your opinion of the Reagan's or their politics, these notes and reflections demonstrate active love, unabashed devotion and the joy two people can share. In the preface, Nancy shares how much her husbands letters have done and meant to her since his illness (this was written before his death). Not only was it full of his words and feelings towards her, but it documented many memories and occasions that they shared - sort of like a timeline. Besides the catch in my throat that it creates every time I even flip through it, it inspires me to cultivate a similar environment in my own marriage. As Valentine's Day approaches, instead of having that day be a motivation to love those in my life, I'm going to work today on creating joyful appreciation in my relationships. I'm learning that a sentiment on a card or a red and pink gift mean so much more when the days and weeks before are spent in appreciation. Write a fun note to someone today.